It’s been a while since we first met Lee Child’s Jack Reacher in Killing Floor. Fifteen years and sixteen novels later, Reacher still lives off the grid, until trouble finds him, and then he does whatever it takes, much to the delight of readers and the dismay of villains. Now someone big is looking for him. Who? And why? 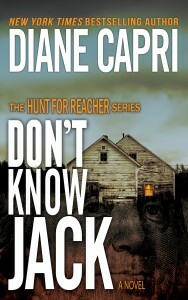 Hunting Jack Reacher is a dangerous business, as FBI Special Agents Kim Otto and Carlos Gaspar are about to find out. Otto and Gaspar are by-the-book hunters who know when to break the rules; Reacher is a stone cold killer. Reacher is a wanted man, but is he their friend or their enemy? Only the secrets hidden in Margrave, Georgia will tell them.